Hi everyone, it is Madeline here. Hope you are all doing well! I’m really excited about this blog as April is my favorite release to date. It is our first release of summer and you can feel it as soon as you see it. The color palette pops with fresh new brights that layer beautifully onto the pastels we have seen in the first two releases and the prints are packed with summer florals. As Sam and I sat down to design last summer, there was one thing on both our minds…summer vacations! One of my very favorite summer vacations is an east coast road trip that I took with my family just two summers ago. We drove down to Florida from NY and back, stopping along the way in some of the most beautiful southern towns. There is something about getting in a car and literally driving off into the sunset that is so exciting. We loved the adventure of finding the best that each town had to offer. Each place so unique and beautiful in its own way….and as long as we all had our favorite things, we were up for the new adventure each day brought. One of the best trips ever! The April release is the best of what Matilda Jane has to offer sprinkled with some great new pieces too. These are all the things you won’t be able to live without whether you are going on vacation or staying local. There are so many amazing styles, but my favorite is the Miss Matilda top for girls (check it out on the site!). This sweet, swiss dotted top is the essential summer top in cool crisp cotton with fun navy clip dot detail, and I love it because goes with absolutely every bottom offered. I also love the Daydream Dress and Pinky Promise tank — they both remind me of summer fun with friends. We are also bringing in some summer fun for tweens! The new release of 435 has beautiful and easy knit tops with fun shorts and skirts to match. We’ve also added some great dresses for tween. The Chic & Chambray is such a great mix of your favorite graphic tank with a pretty chambray skirt for a cool and casual look. Since I originally started out designing just womens, the womens dresses have a special place in my heart. There is a look for everyone. In the Clouds for that cool, vacation look worn with a sunkissed glow is the best accessory for summer. The Wanderlust is my favorite way to mix fun stripes and beautiful florals in that fun MJ way that takes something as easy as a tank dress and makes it a statement piece. Last but not least, we have the perfect mix of items for your littlest one. Your baby girls will be outfitted with the sweetest looks in the softest fabrics. The Pinwheel Swing dress is a pretty little number for your twirler in training. 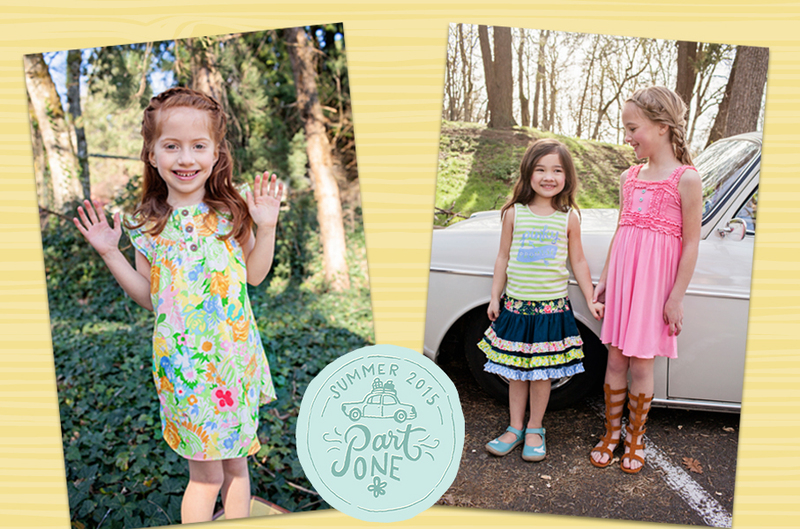 The Smiles and Sunshine Dress is an MJ fave! The Something Blue bubble and Pretty Posies Bodysuit are easy, beautiful one piece looks for your baby. No matter where your summer adventures lead you and your families, we hope you’ll find your perfect pieces here. Madeline, you and Sam did a fantastic job with this release.